Marina Bay is a popular area of Singapore - located there is the famous Marina Bay Sands hotel which features accommodation, shopping and restaurants - as well as connection to the bays shopping malls and convention centre. To get to Marina Bay, the most efficient method is most certainly by hiring a Changi airport taxi (also the only direct method), which will take around 17 minutes with no traffic and cost around 12€ (S$20) in normal conditions. In order to take the metro or MRT, it will be necessary to take a couple of different lines to reach Bayfront - this will take around 30 minutes and cost 1.20€ (S$2). The same applies for the bus - which will take around 40 minutes (including a short walk) as you will need to alight at a nearby stop to reach the Bay area. This trip will cost 1.50€ (S$2.50). There is no direct line on the metro from Changi Airport to the Bay area. Taking the metro will require a couple of line changes. When you enter the metro at Changi, you will take it to Tanah Merah station. From here take the East/West Green line to Payar Lebar, where you can change to the Circle (Yellow) Line and alight at Bayfront. 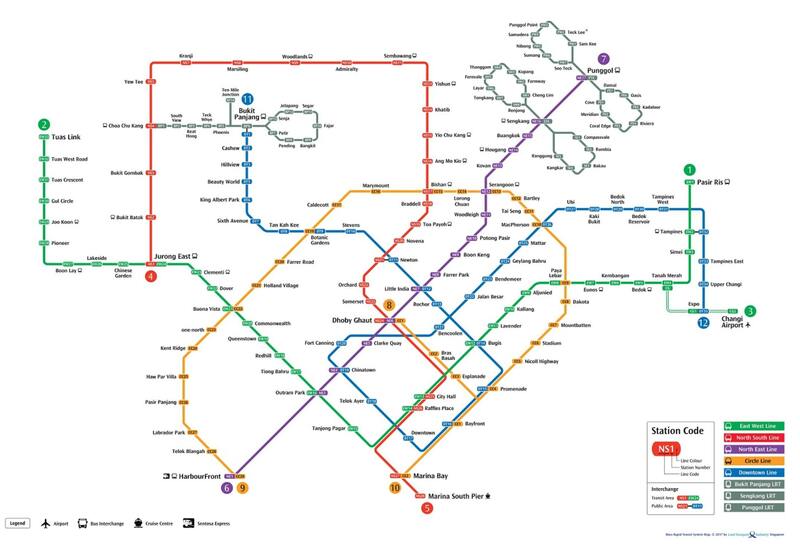 Alternatively, you can travel to Bugis Station from Tanah Merah and take the Downtown (Blue) Line to Bayfront. Both methods are similar in time and will cost the same. Note the peak hours of the metro apply between 08:00am-09:00am, 12:30pm-02:00pm and 07:30pm - 10:15pm every day. How much is the metro from Singapore Airport to Marina Bay? The metro cost is dependent on the method of payment used. It is better value to purchase the EZ-Link card, as this is a rechargeable card that can be used on multiple kinds of public transport and provides a discount on these journeys. These are available at ticket offices near the MRT terminal in the airport and is also refundable when you leave the city. The card will cost 3€ (S$5) and the rest of the top up is credit. By this method the MRT journey will cost 1.08€ (S$1.74). The MRT is the most commonly used transport option in Singapore, therefore it can be busy and tiresome after a long flight, especially with multiple transfers and luggage. Marina Bay Sands and the shopping area is connected to the Bayfront Station, so you will have easy access to the hotel shopping and connected restaurants through this stop. You can also alight from the E/W (Green) Line at Raffles Place across Marina Bay - for a famous Singapore Sling! Marina Bay provides a nice walk at night, if you decide to you can alight earlier and take the walk to see the view! By taxi is the quickest and most comfortable method of transport into Marina Bay. The taxi will take you directly to any area within the bay - available 24/7 at the airport. Singapore airport taxis are available at all 3 terminals at ranks, and the journey by taxi should take you around 17 minutes, making it much quicker than both the MRT and bus. Taxis in Singapore are run by many different companies; therefore, the taxis at the rank can be many different types and colours. Just ensure that the taxi has a licence inside and a meter running. Taxis in Singapore are metered and the fare is affected by a number of different factors. In usual conditions, the journey should cost around 12€ (S$20). Taxis in Singapore are comfortable and efficient, especially for those with luggage. Taxis also provide the only direct method of reaching Marina Bay. 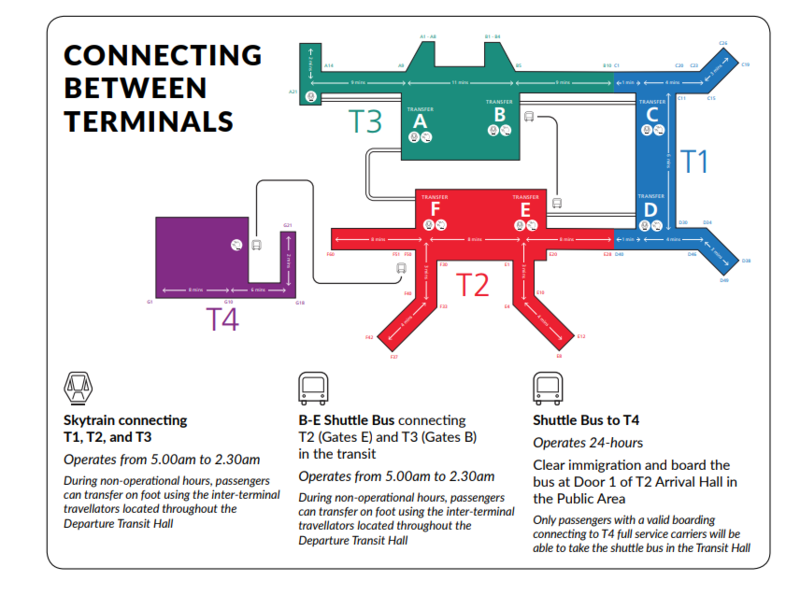 If you are staying at Marina Bay Sands hotel, there is an airport shuttle available for free for hotel guests - available from T2 (left after customs) and T3 (right after customs). Marina Bay Sands is an extremely popular destination of the Bay area for shopping and food. If you are wishing to visit the Gardens by the Bay you will need to go to Marina Bay - it is especially beautiful at night! There are many light shows, restaurants and shopping available in the picturesque Bay area. Just like the MRT, there is no direct method of reaching Marina Bay by bus and there will inevitably be a short walk from wherever you alight. However, if you have not much luggage, the walk around the Bay is very pleasant. If you take the bus you will need to take the 36/36A from the airport and alight at either Raffles Ave or Temasek Blvd, depending on which side of the Bay you would like to be on. The journey will take a while by bus - around 50 minutes, as there are many stops, plus a walk of approximately 10 minutes around the Bay area. Note: There is a shuttle bus service that also runs from the airport, however it is more expensive at 5.60€ (S$9pp), and is best for light luggage and solo travelers. It will do drop offs to major hotels, and is 24 hours - leaving every 15 minutes in peak hours or 30 minutes otherwise. It will take approximately 25 minutes to reach the centre and tickets can be purchased from the Ground Transport Desk at the arrivals. How much is the bus from Singapore Airport to Marina Bay? The bus driver is payable for a standard ticket - however be aware that the driver does not give change, so have the correct amount on you. The EZ-Link card can be purchased at the ticketing offices in the arrivals area of the airport. Although cheap, the bus is not very efficient and can be cumbersome after a long flight. The drop-off points around the Bay mean that you will likely have an additional walk to worry about after you alight also. The bus, like the MRT, is not the most luggage-friendly option. Consider a taxi if you have many bags. The bus can be very crowded during peak-hours. Make sure you check the timetable for the bus - some buses run express services and don't make the same stops as the standard one. The bus will be labelled 36 until night-time, where it will change to the 36A. How much is a taxi from Singapore Airport to Marina Bay? The taxi from Singapore Airport will be metered, and there are a number of factors that can affect the price. In standard conditions the fare should be around 12€ (S$20). How many transfer options are there from Singapore Airport to Marina Bay? There are three transport options available from Singapore Airport to Marina Bay, these are taxi, MRT (metro) and bus. However, by taxi is the only direct route to your destination in the Bay. How far is Singapore Airport from Marina Bay? Singapore Airport is located approximately 18.8km down the coast from the airport. The journey by taxi should take around 17 minutes from the airport in standard traffic.